Super Savings Item! Free Shipping Included! 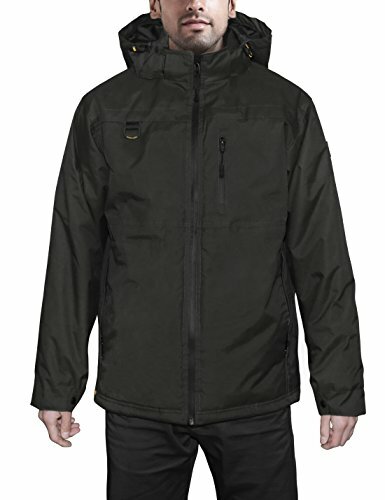 Save 37% on the HARD LAND Mens Waterproof Down Parka Jacket Heavy Winter Coat Snowboard Jacket With Removable Hood Black Size XXXL by HARD LAND at Sherlock Coat. Hurry! Limited time offer. Offer valid only while supplies last. Shell: 100% Nylon; Lining: 100% Polyester; Filling: 90% White Duck Down. Water Resistant but Breathable. DWR(durable water repellent ) finish, seam taped and waterproof zipper keeps you dry and moving in light rain and wet weather. Windproof.The windbreaker featuring detachable and adjustable hood, internal drawcord hem and stretchable hidden storm cuffs to keep warmth in and wind out. Multiple Practical Pockets. 1 zippered chest pocket （passport or cards stowed); 2 lower hand cargo pockets with zip closure; 2 innovative interior pocket for additional storage and 1 phone pocket where you'd put your "media device". So many pockets for anything imaginable. This winter jacket can handle inclement weather easily, such as below freezing, heavy fog, rainy or snow day. Relaxed-fit and plus size type is not only made for outdoor work, but also suitable for riding, motorbiking, camping, hiking, skiing, snowboarding, hunting, fishing and everyday jacket. If you have any questions about this product by HARD LAND, contact us by completing and submitting the form below. If you are looking for a specif part number, please include it with your message.